Here is a recipe for you chocoholics out there. 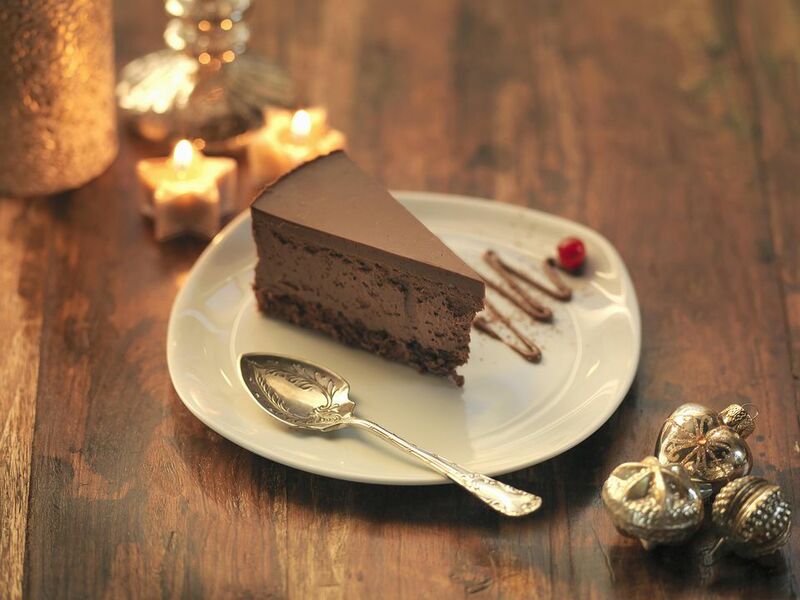 Not only do you get a healthy helping of chocolate in the torte, but it’s also topped with a deep dark chocolate ganache. Be sure to eat slowly as to enjoy all that chocolate goodness. Preheat the oven to 350 degrees F. Cut a circle of parchment paper to fit in the bottom of a 9-inch springform pan. Butter the bottom and sides of the pan. Place the parchment circle in bottom of pan. Butter the top of the parchment paper as well. Place the butter in a double boiler over simmering water. Add the chocolate chips to the pan. Once both the butter and the chips are melted, whisk them until well combined. Next, whisk in the cocoa and coffee powder. Cool the chocolate mixture for at least 10 minutes. Beat the eggs and sugar in a large bowl until thick, about 6 minutes with an electric or stand mixer. Add a small amount of the chocolate mixture to the egg mixture. Quickly stir it in. Fold in the rest of the chocolate mixture. Stir in a figure 8 fashion. Pour the batter into prepared pan. Bake torte for 42 minutes. A cake test should come out slightly wet as to not over bake the torte. Cool in the pan on a baking rack for at least an hour. The center may fall slightly. If the center does fall, press down the edges to be even with the middle of the torte. Take a butter knife and cut around the edges of the pan to loosen the cake from the sides. Remove the sides of the springform pan. Slide the cake off of the bottom part of the pan to a serving platter. If possible, remove the parchment paper during this process. Cool the torte completely before adding the ganache. While the torte is cooling, make the ganache. Place the dark chocolate chips in a medium-sized bowl and set aside. Heat the cream on the stove or in the microwave only until it bubbles around the edges. Be careful to not boil or burn it. Once the cream is steaming and there are bubbles around the edges, pour it over the dark chocolate chips in the bowl. Cover the bowl with plastic wrap and set aside for 15 minutes. Stir until the mixture is smooth. Pour the glaze over the torte beginning at the center. Smooth the top with a spatula. For a lovely effect, allow it to drip down the sides of the torte. Refrigerate it uncovered until the glaze is set. This takes about an hour. Serve with freshly freshly whipped cream.